Tackling this issue requires some really smart thinking and loads of testing, so I won’t insult you with platitudes. Well, maybe one: Creighton Abrams wrote, “When eating an elephant take one bite at a time” (apologies to my animal welfare and environmental clients). This article’s bite is about tossing out some perceived wisdoms you might be holding onto, and helping you turn online advertising into a successful fundraising channel. Let’s start by extricating this overly-used, meaningless word “digital.” People once painted on cave walls. Now they share photos of their hunt with their followers. Things change. It’s all “digital” now. We are touched by digital messages nearly every waking hour of the day: whether working, leisure reading, viewing, or browsing. Start your strategy with a hypothesis of your target audience’s daily habits and develop a touchpoint plan that envelops their day and incorporates many publishers and channels (i.e., display, social, incentivized, affinity email).Your audience will tune in to some and tune out of others, but online is a frequency medium, and messages become cumulative and finally stick. Your online test should begin by casting a wide tactical net.. Our initial plans for nonprofits always include one or more of the larger networks (Aol, Yahoo), with target demographics that include what we know (our current donor profile), what we hope to discover (i.e., younger donors), and a smattering of what we don’t know (surprise!). The ideal creative approach could be the subject of its own article. In brief, you should develop at least 3-5 creative approaches. The concepts should span a motivational and emotional spectrum, and the messaging should allow you to test value propositions and messaging approaches. But keep the brand tight. Your brand is the glue that holds the campaign together, so make sure all of your ads feel connected and build a brand voice together, rather than compete with itself for attention. Your web team and ad team need to work hand-in-glove when it comes to tracking the activity of your launch. Every ad unit, search result, social destination, or text link needs to be tagged, and every page on your web site needs to be pixeled. Campaign intelligence will be the lifeblood of your online campaign. Also be sure to factor in other drivers that may be in market when your online test begins. Is there DRTV running? A mail drop? Make sure you establish web traffic benchmarks and donation baselines so you can isolate the results of each tactic. The moment you hit the big “Go” button, the real work of your campaign begins. Sorry, you can’t “set it and forget it.”Keep your hands on the levers of the campaign control room. Tweak the media by watching the performance by publisher, time of day, and audience segment. That doesn’t mean that each segment gets the same optimization but rather knowing that each segment is OK to operate with its own top performers. A unifying theme might exist in line with an overall strategy, but it’s our job to know when and where to pull those levers. Optimize the creative by testing calls-to-action, photography, and copy. And do it all in real time. The need for speed and fluidity means your media, creative, and analytics teams need to be at the same table. Times used to be simpler. Crowning a winning creative was as easy as examining the results of package A vs. package B. With online, there is a tangled web of targeting, publishers, and creative. If you analyze it correctly, you can define which creative works best for which specific audience member. That means the master King Control will not have as much power over the common creative, as each ad will remain active where it individually shines. Also, online creative is very susceptible to creative fatigue. With our own studies, we’ve defined that a creative concept can begin to fatigue within 10 days in market (this varies depending on media spend). That means your control creatives will need to adapt and evolve to survive. Up until now you may have looked at the source code results of your online marketing and seen the majority was from search engines. In order of popularity it was Paid Search, Organic Search, and then Direct-to-Site, right? And click-throughs from your display program or other online ad efforts were infinitesimal. The conclusion is often, “Display doesn’t work, but search is great. Let’s put all our money in earch.” Not so fast…. That’s like giving the cash register credit for store traffic. To grow an online fundraising campaign, you’ll have to lose your dependency on source code data to make campaign decisions. We know your finance team will still want to see that data, and you should show it to them, but if you are making marketing decisions, push source codes to the side, and look at the full picture. Remember when we told you to tag every impression and pixel every web page? That data will illuminate the full path that donors traversed to contribute on your site. Now you’ll know which publishers introduced donors to your organization. You’ll see the hidden influence of creative impressions. You will be able to finally decipher which placements are inspiring searches, which are leading to donations. Growing an online campaign is all about funding the top of the funnel so search can excel at closing the deal. Source code data will never give you that insight. Getting started might sound like a lot of work (it is), costly (it doesn’t have to be), and complex (it can be). But when you start seeing new-to-file names topping 75% (and you’ve got a solid CRM strategy in place), you can see the importance of trawling these waters. 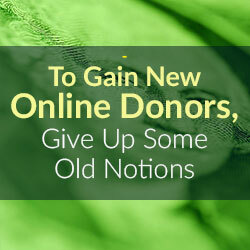 Your future donors and current donors are online, engaged throughout the day. It’s a pretty good plan to have them see you there too. Even if your organization only has a modest marketing budget, applying some of these strategies will open new pathways to find your elusive online donors. Tom Goosmann co-founded True North Inc. in 1994 with business partner Steve Fuchs. The duo brought years of direct marketing experience into the dawn of the digital age and have built a bi-coastal shop that offers clients full online and offline service. True North is an independent advertising agency that strategically melds creative, media, and analytics to produce measurable results for some of the world's most recognized brands. The full service multi-platform (online, email, social, mobile, traditional) agency leverages personal consumer connections to brands to inspire authentic communication that develops into mutually beneficial commitments. True North is headquartered in New York with offices in San Francisco; the privately held company has more than 60 employees. In his role as Chief Creative Officer, Mr. Goosmann has been recognized time and time again for forward thinking in interactive advertising, technological leadership, and media excellence, delivering profitable results for top brands. He gives creative guidance to his teams as the agency for many facets of the Walt Disney Company, among them Disney Visa Card and Disney Parks, the new adjustable eyewear maker Adlens, and a roster of nonprofit clients. Before starting True North, Mr. Goosmann was the Creative Director for Direct Marketing Group from 1990 to 1994 where he learned the direct discipline "from hardened old school folks." Met many talented and abused people he thinks about to this day. Also learned how not to run, or sell, a company. RIP DMG. Mr. Goosmann is a member of the Internet Advertising Bureau, The Direct Marketing Association, and The Direct Marketing Club of New York. He and his wife Melissa live in Connecticut with their twin 13-year-olds.